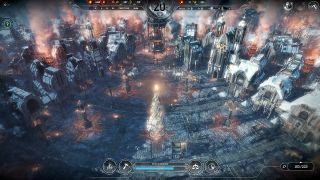 Despite the perpetual winter, Frostpunk couldn't be described as festive, but thanks to the free update, A Christmas Carol, the gloomy survival management game’s Endless mode is getting a little speck of hope in the form of a new holiday quest and a massive Christmas tree. It’s not a surprise that Frostpunk identifies with Dickens. Its frozen industrial city is an analogue for Victorian London, full of factories and poverty, while the themes of crappy working conditions and the poor treatment of the working class crop up in the difficult decisions you have to make when running your struggling haven. The update introduces a new quest in Endless mode, where survivors will approach you in the hope that you’ll preserve Christmas for the next generation by hosting a big communal meal and distributing presents. I know that if I was facing a miserable (but probably brief) life in a frozen wasteland at the end of the world, a present would cheer me right up. Unfortunately, given the era, it would probably just be a hoop. The Victorians had rubbish toys. It wouldn’t be Frostpunk without something to balance out the cheer, of course, so you’ll have to weigh the costs of having a party and plonking down a lovely Christmas tree with the benefit to morale. A celebration might go down well at first, but everyone will be a lot less chipper when they realise they've scoffed the last of the food. A Christmas Carol is free and out now.